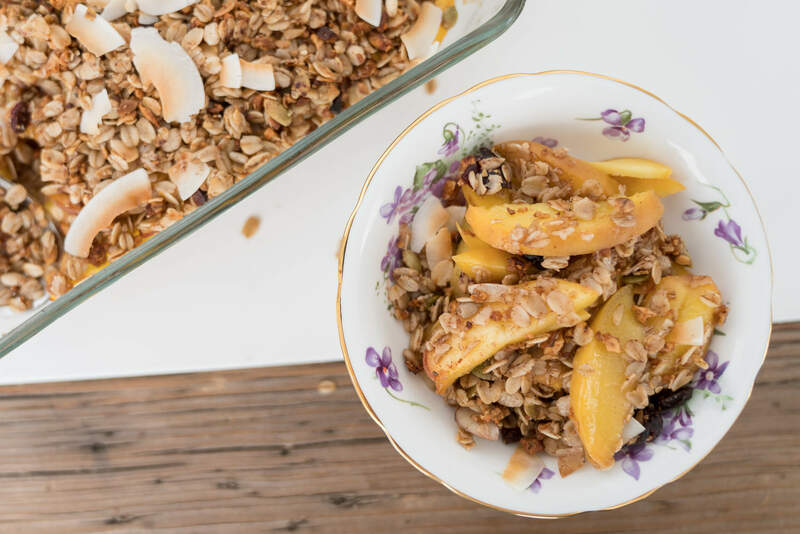 I've got a new and updated recipe for Peach Coconut Crisp! What could more perfect than a hot summer day with blue skies, zero smog (yes, we worry about these things in Toronto) and a day to play? 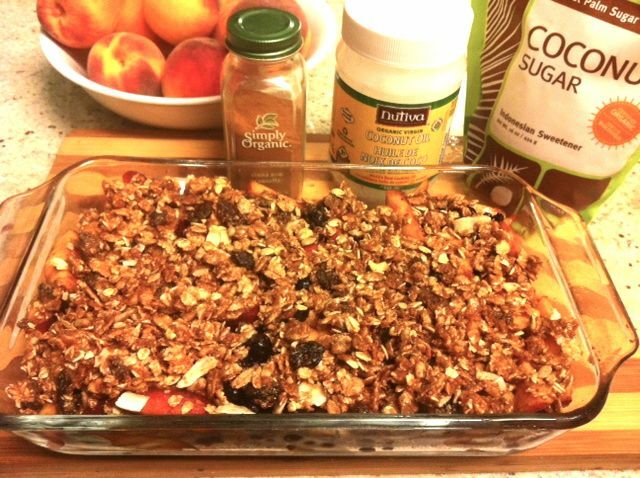 Well my dear, this dessert I made on the weekend - Peach Blueberry Crisp!! Yes, this is as lovely as a perfect summer day. It tasted as divine as it looks! So I ended up with two baskets of peaches in my hand because the smell lured me over at the market. I arrived home, made dinner and thought to myself, what am I going to do with these peaches (aside from eat them one-by-one)? The very sweet smell was a good indication they wouldn't last forever and Walker wasn't going to let that happen either (aka the peach monster) as he ate three in a row!! So rather than let the fruit flies get to them or the fruit monster, I decided to whip up this quick and easy dessert! Nutrients in peaches such as lycopene and lutein help protect the heart and eyes. The high beta-carotene content makes them important heart health foods. Beta-carotene helps protect LDL cholesterol from oxidation, which may help prevent heart disease. A good source of disease-fighting fibre. Peaches are a good source of immune-boosting and beautifying vitamin C.
Peaches are a rich source of potassium. In fact, 1 peach has 308mg per peach whereas a banana has about 400. 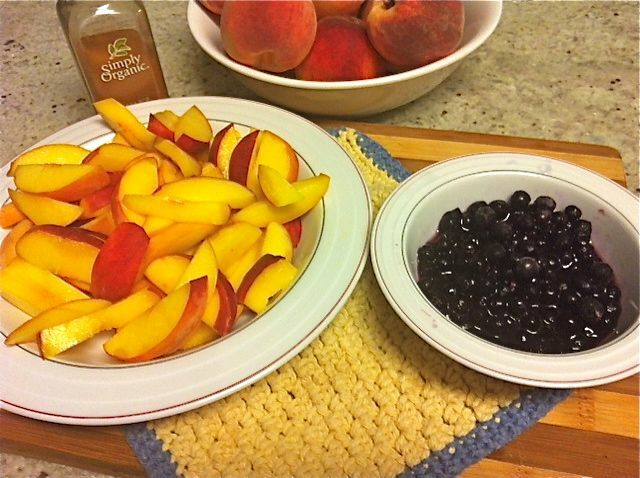 Method: Combine your peaches, blueberries and cinnamon together into a large bowl. Once the fruit is covered lightly with cinnamon, place in a baking dish. If you want a deep crisp use a small baking dish. I used a small size lasagna pan as you can see. Combine the topping ingredients into a bowl and mix well. Spoon the topping over the fruit, pop in oven at 350 degrees for 30 minutes and voila! Makes about 4-6 healthy servings. In fact, I schlopped some greek yogurt on top and enjoyed it as breakfast two days in a row! 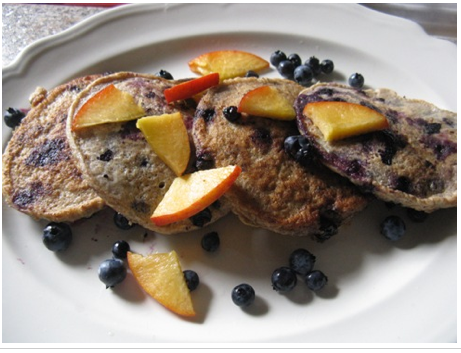 Tis the season for blueberries and peaches, so here's another delicious and nutritionist-approved recipe: Blueberry Spelt Pancakes with Peaches and Walnuts! This looks delicious! I love how there are so few ingredients too. Me too, that's my favourite way to cook -- keep it simple! This receipe is truly fabulous. It was a big hit in my house. I didn't have to use any sugar as the peaches were so sweet. So easy too. Thanks for this!! It was delicious! I actually decided not to add the coconut sugar but then poured a little maple syrup on it, so good !! I think I will try adding the coconut sugar next time! If I only have steel cut oats, how do I adjust this recipe? Do I soak the oats first? If yes, how long?